Agri-husband Sze hails from Hong Kong and has grown up making stir fry with all kinds of fresh ingredients. Sugar snap peas are the star of this particular version, though you can use any vegetables or protein you like. 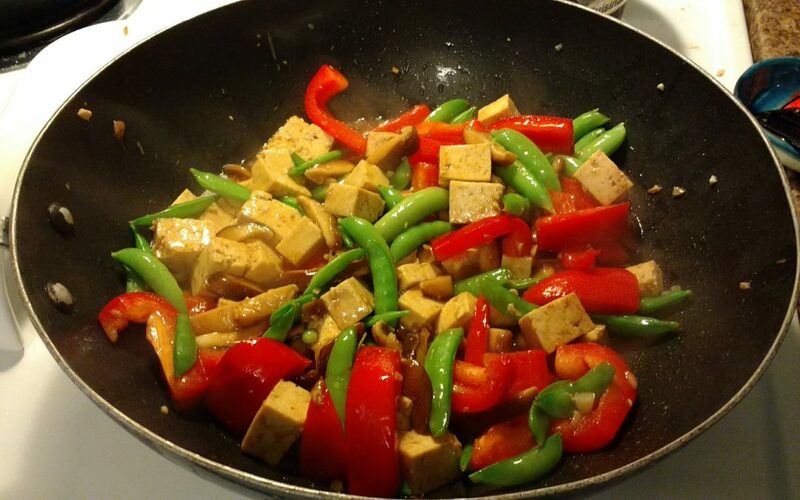 If using tofu, about 1 hour before cooking, remove from packaging. Wrap in paper towels or a clean tea towel and put on a flat cutting board. Weigh down the tofu with a heavy skillet or plates to remove as much moisture as possible. Mix all ingredients for sauce except sesame oil together in a small bowl. Make sure all of your vegetables are prepped before you start cooking. Stir fry moves very fast! When your tofu (or protein of choice) is drained, cut into 1 inch cubes. Heat a wok on high until it begins to smoke. You want a really, really hot pan to maintain the texture of the ingredients and still cook them thoroughly. Add coconut oil to your wok to melt, swirling it to coat the pan. Carefully add ginger, garlic, and white parts of your green onions. Cook, stirring constantly, until very fragrant, about 30 seconds. Add tofu or chicken and mushrooms and continue to toss for about 3 minutes. Stir in snap peas and bell peppers and cook for another 2 minutes. Reduce heat to medium high and add sauce, then toss to coat. Remove from heat and drizzle with sesame oil. Stir in green onions and serve over rice. This recipe has a number of specialized ingredients, but most of them can be found a Kroger, Wegmans, or Whole Foods. If you have trouble finding any, Tan A grocery has a great selection of Asian sauces. The whole family enjoyed this! Loved the light, fresh tasting sauce.